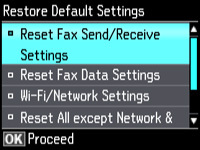 Press the left or right arrow button, select Setup, then press OK.
Press the up or down arrow button, select Restore Default Settings, then press OK. Select Wi-Fi/Network Settings to reset all network settings. Unplug the power cord of your router from the power outlet, wait a brief period, then plug it back in. You may need to re-establish the connection for the other devices on your network.